Please note that the vast majority of people do not get tested for influenza, therefore data presented here maybe underestimating influenza activity. 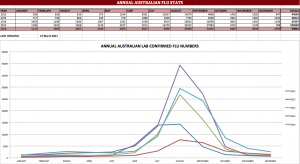 2018: 58,570 Laboratory confirmed notifications of Influenza in Australia, for the calendar year. To download a PDF of the graph for 2017, click below. 2017: 249,882 laboratory confirmed notifications of Influenza in Australia, for the calendar year. 2016: 90,861 laboratory confirmed notifications of Influenza in Australia, for the calendar year. To download a PDF of the graph for 2016, click below.